John K. Johnston was born in Northern Ireland and immigrated to Canada in 1970. A retired Police Officer, John started his police career in Northern Ireland. On immigrating to Canada, he continued his career in the Policing with the Hamilton Harbour Police and the Hamilton Police. After a total of forty-five years service, he retired in June of 2009. John has been married to Ann for forty-four years. They have two sons - the elder son, following in his father's footsteps is a Police Officer (in Peel Region) and with the assistance of his wife has presented John and Ann with a grandson and a granddaughter. John's younger son is an Executive Producer at Rogers Sportsnet. John enjoys golfing and is an avid soccer fan, his favourite team being Manchester United. John joined Hugh Murray No. 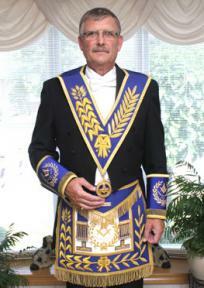 602 Lodge on March 17, 1976 and was installed as the Master in December 1983. He also served two additional terms as Master - 1999-2000 and 2005-2006. John was made a Fellow of the College of Freemasonry in January 2010 after completing the necessary course material, and has also completed the District Deputy preparatory course. As a Past Master of Hugh Murray Lodge, John has served as an Auditor and as the Hugh Murray Lodge Representative to the Masonic Bureau. At the District Level, John has served as the Chairman of the Benevolence Committee, the Lodge Resources Committee and the Masonic Education Committee.